Is there a better alternative to Compress? Is Compress really the best app in Compression category? Will Compress work good on macOS 10.13.4? 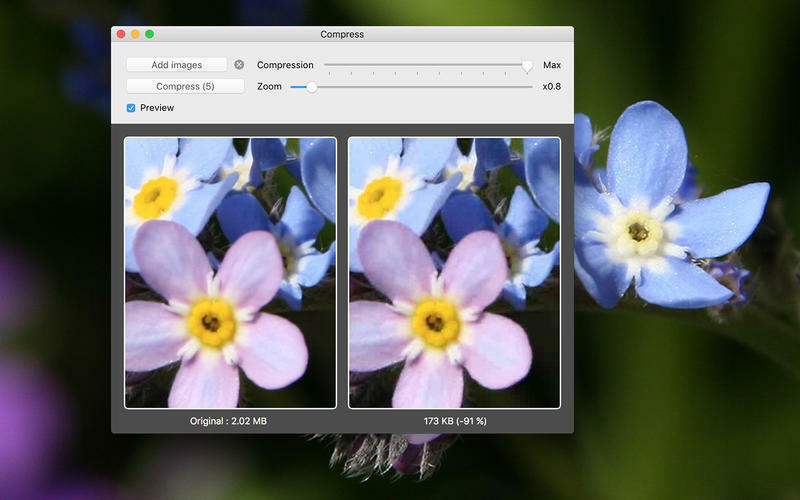 Compress reduces the file size of your pictures in just a few clicks, while maintaining the image quality. By adjusting the compression ratio, you can view the difference in quality as compared to the original, as well as the compressed image size. You will be amazed by how much you can reduce the weight with no visible difference in image quality. Thanks to the parallel comparison of the original and the post-compression images, you can adjust the weight of your photos to be exactly as you need them! Compress needs a rating. Be the first to rate this app and get the discussion started!